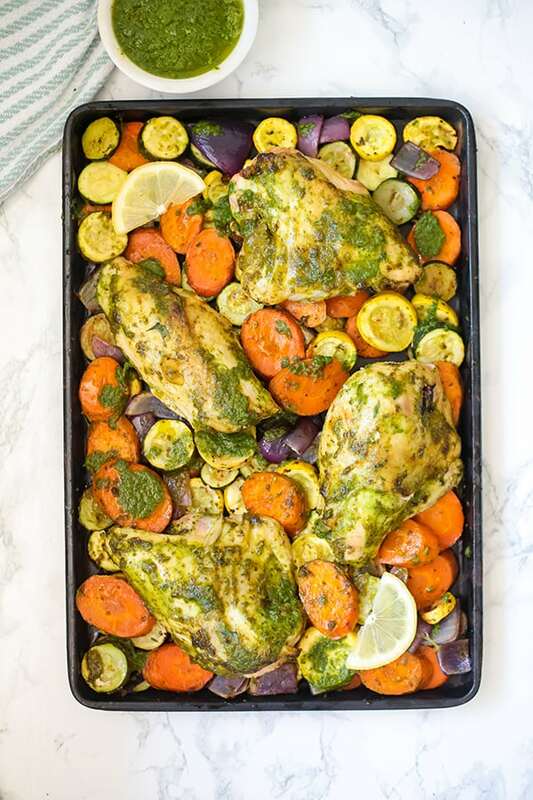 This one-pan chicken pesto with vegetables is the perfect thing to make on a weeknight. It’s paleo, Whole30, AIP, and incredibly delicious. As life gets busier, I begin to appreciate one-pan meals more and more! I love cracking open my favorite cookbook and going to town on a fun recipe as much as anyone else, but sometimes the cleanup and cooking are a bit too much more than I’m willing to handle. With my job, my kitchen is basically always a wreck, to begin with… why mess it up even more and create more work for myself? This easy chicken pesto is made on one pan and features a simple to blend homemade pesto that you’ll love topping everything with! It’s an amazing springtime meal, but really, it’s a great dinner option any day that you’re wanting something delicious but with less work. The pesto on this one-pan meal is totally nut free making it allergen friendly, and AIP. It also features fresh mint and argula that give it a bit more interest than just your typical pesto. Trust me, you’re going to be wanting to put this on everything! I use bone-in chicken breast. You can use breast or thigh, but I highly recommend using bone in. It really enhances the flavor and keeps the chicken from getting too dry if you choose to use this as meal prep. I use red onion, zucchini, yellow squash, and carrots. However, you can also swap out other veggies like brussel sprouts, mushrooms asparagus, or more. Just make sure that the veggies are all around even thickness and take about the same time to roast. These are the ingredients for the pesto. I use avocado oil since it’s high heat cooking, but you can use olive oil if you’d prefer the flavor. 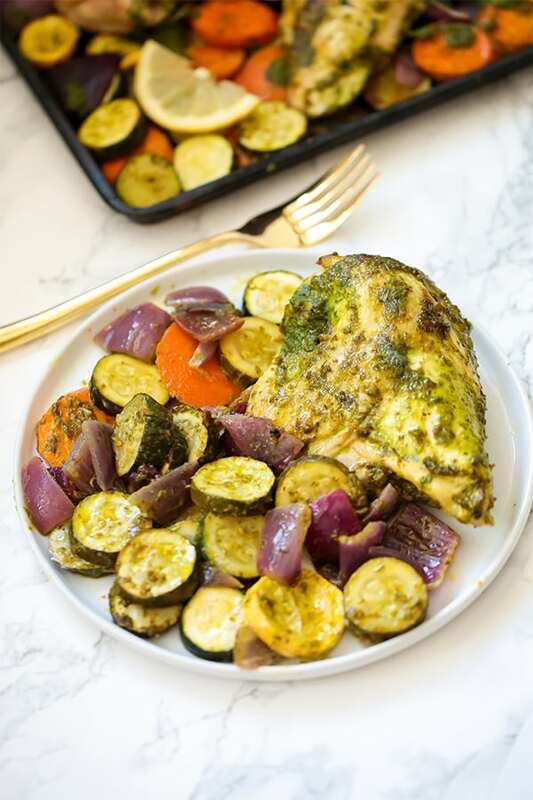 This one-pan chicken pesto with vegetables is the perfect weeknight meal! It’s nutrient dense and packed with fresh flavors. Combine the pesto ingredients in a blender until thoroughly combined and set aside. Place all of the sheet pan ingredients on the pan and evenly space them, not to overcrowd the pan (see notes). 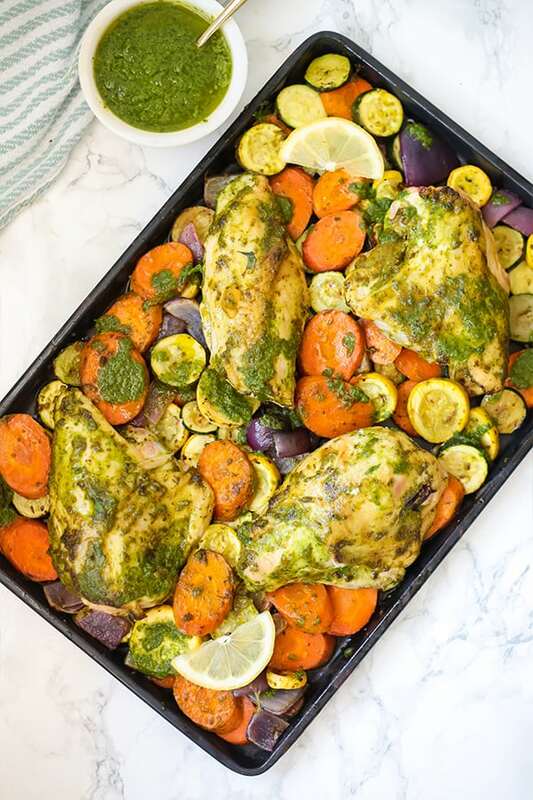 Evenly coat the chicken and vegetables with the pesto, reserving about 1-2 tbsp of the pesto on the side for later topping if desired. Place in the oven and periodically flip the veggies every 10 minutes or so to evenly bake. 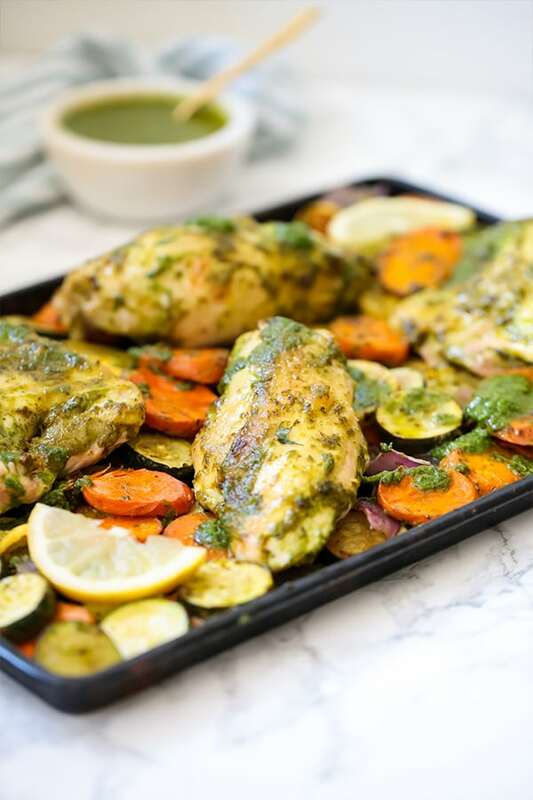 Bake for 30-35 minutes, or until chicken reaches an internal temperature of 165 F.
Remove from the oven and top with additional pesto if desired before serving. Note that the photos were taken on a slightly smaller pan than the dish was cooked on. Be sure to not overcrowd the pan! You can easily scale down the recipe to fit your pan. This was really good! I love that I can mix the vegetables up. Definitely going to make it again and again! Does this recipe hold well in the fridge if extra is remaining for leftovers the next day? I find that chicken can go off very quickly when kept for leftovers. Hi Alex! It does work well as a meal prep dish for me… especially just for one day! I made this for my family and everyone loved it! It was great because my husband is AIP and he could enjoy it as well! Thanks Michelle!